The high performance luminaire is designed for applications where long life, low maintenance, and consistent color rendering is required. 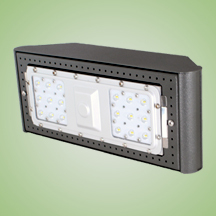 The fixture has a wide range of mounting options and optimal light control. The fixture can be ground, wall, or pole mounted making it versatile enough for commercial, industrial, or residential lighting applications. The heavy duty housing is constructed of cast aluminum. The optical assemblies are sealed in place using a silicone gasket for weather tight protection. Modular LED bricks wired in parallel for ease of maintenance. ETL listed for wet locations (IP64). Additional IP66 rating available upon request. Standard mounting options include 1/2” adjustable knuckle fitter. Additional mounting options such as a 2” adjustable knuckle are available.